This is a fabulous party appetizer, fun weekend lunch or “finger food friday” vegetarian supper meal. An even simpler version of this dip that is still delicious is done by layering refried beans, avocado mixed with lime juice, salsa and grated cheese. Mix the refried beans together with chill powder and cumin and spread over a 9-inch pie plate or platter. Next mash the avocados with the juice of the lime and spread over the beans. 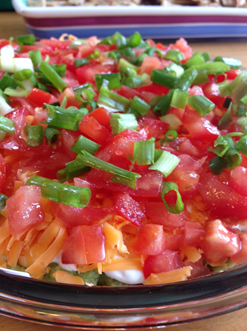 Layer the remaining ingredients one at a time and serve with tortilla chips. *Que Pasa brand tortilla chips are my favorite or make your own homemade baked tortilla chips or pita chips (cut flour tortillas or pitas into triangles, brush with oil, sprinkle with a pinch of salt and bake until crispy). Other great additions to your layered bean dip include: fresh jalepeno peppers, canned green chiles, canned chipotle peppers, corn, red/green peppers, shredded lettuce, olives, fresh diced tomatoes or cilantro. You can also substitute the cheddar cheese with feta or queso fresco cheese.